Do customers ever ask you where the nearest ATM machine is? If you’re pointing them to another establishment, then you’re losing money. The facts are hard to argue. 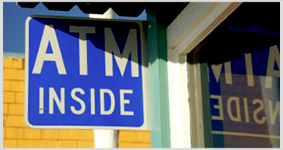 Studies have proven that an ATM placed on premise attracts customers to engage in impulse buying. Approximately 25% of your customers will spend more just because of the additional convenience of cash on demand. Also, giving customers more access to cash means less credit card transactions and the potential for bad checks. For these reasons, it’s obvious why today there are more than 1.8 million ATMs worldwide and why this has become the most requested service in retail, hospitality and the convenience industries. Stop sending potential customers away…and become that location that other establishments point customers to with your own ATM machine on premise. You’ll increase monthly sales by 7 to 15 percent and also obtain another promotional device since the machines allow for on-screen advertising and coupon dispensing. Davol Vending can provide you with an ATM machine in two ways. We can install, monitor and load the machines for a small percentage of the profit shares. Or, we can set up an ATM split agreement where we install the ATM, but you load it with your own money, and we share 50% of the profit percentage with you. *Attract more customer to your business who otherwise wouldn't come to you. *Increase monthly sales by 7-10%. *Typical ATM customers spend 20% more than a non-ATM customer. *Eliminate or reduce the need to accept the checks. for your free, no obligation consultation. Davol is the leading provider of amusement equipment throughout the Austin area including Bastrop, Cedar Park, Elgin, Killeen, Georgetown, Lakeway, Leander, Round Rock, San Marcos, Taylor, Temple, Belton, Liberty Hill, Copperas Cove, Hutto, Rockdale, Luling, Lockhart, Gonzales, Marble Falls, Burnet, Shiner, Lampasas, Johnson City, Buchanan Dam, Llano, Smithville, Granger, Bertram, Wimberley, Buda, Jarrell, Florence, Thorndale, Rockdale, Austin, and Kyle. Davol Vending is “Simply The Best’ in the most modern quality equipment and service!